We know that positive, fulfilling and satisfying relationships are strong predictors of life satisfaction, psychological health, and physical well-being. 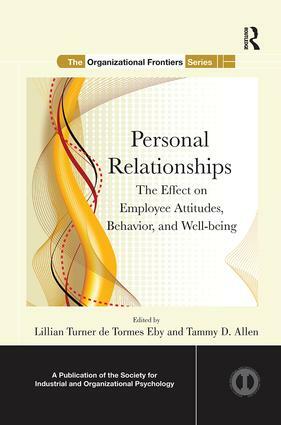 This edited volume uses research and theory on the need to belong as a foundation to explore various types of relationships, with an emphasis on the influence of these relationships on employee attitudes, behaviors and well-being. The book considers a wide range of relationships that may affect work attitudes, specifically, supervisory, co-worker, team, customer and non-work relationships. The study of relationships spans many sub-areas within I/O Psychology and Social Psychology, including leadership, supervision, mentoring, work-related social support, work teams, bullying/interpersonal deviance and the work/non work interface.